Content Management Systems (CMS) were designed to make it easier for people to manage complex websites with multiple authors, editors and translators, each with different roles and privileges within the system. These systems have been around since the beginning of the web itself, and have different features depending on the type of system and its intended use. Content management systems have recently begun to recognize the importance of multilingual publishing, and now offer ways to publish and manage articles in more than one language. Adding automated links to machine translation versions of your content. Building separate, parallel sites for each individual language. Using a single, multilingual CMS (e.g. 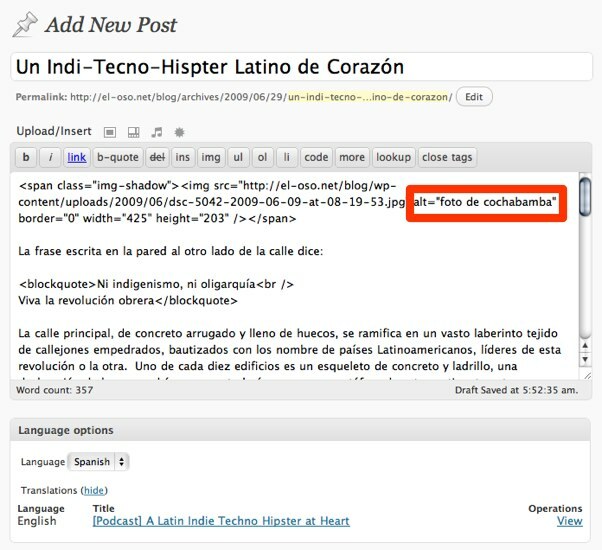 Drupal, Joomla, WordPress) to manage translations of original articles. Using an RSS translator to import content to a platform where entries can be translated into other languages. 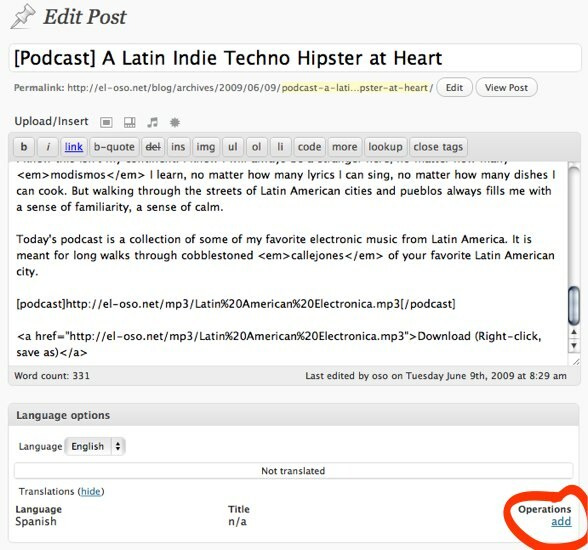 Translations are then made available in a separate RSS feed. Which approach is best depends on the type of site you run, how many articles you post per day, and how important it is for multilingual content to be integrated with your primary website or language. If you are building a fairly simple site, with a relatively low volume of posts, and expect other languages to be a minority of your audience, the best approach is to set up a parallel, sister site for each language you seek to support. For example Yoani Sánchez is a popular Cuban blogger who writes in Spanish at http://www.desdecuba.com/generaciony/. Many of her readers have volunteered to translate her blog posts into over a dozen other languages. Those translations are published on parallel blogs. For example, Japanese translations of Yoani's posts are available at http://desdecuba.com/generaciony_jp/. This approach requires minimal additional effort and is easy to manage. Cross-link source and translated entries. Use multilingual tags for posts, so search engines are more likely to pick up on foreign language search terms. Embed block quotes from the original in the translation, both so readers can compare the original text, and so that search engines are likely to work for both original and translated search terms. Encourage translators to contact you, so you can maintain an index of translations and translators on your site, and encourage them to continue doing so. Another approach is to use a multilingual CMS, such as Drupal, Joomla, or WordPress. These systems allow a single post to be associated with translations, which in turn can be displayed adjacent to the original post, or when the user switches to a different language using a language selection menu on the home page. These translations are not generated automatically, so you need people to create them, and you need to have a system for notifying translators of new articles and changes to articles which have already been translated. Some CMSs, Drupal especially, are designed to support translations in the core system. This means you can "skin" a post in any number of languages. You might write the original post in English, and then create many child documents in other languages, which the system treats as translations of the original post. So when the user switches the user interface to German, he will see German versions of posts and pages, if they are available. There are many content management systems and many different plugins for each system that allow you to publish, manage, and organize content in multiple languages. What follows is a sample workflow using WordPress (http://wordpress.org) as a content management system and WPML (http://wpml.org/) as a plugin to manage translations. A guide to WordPress is available at http://en.flossmanuals.net/wordpress. In addition to translating all of the text of the blog post, it is also important to translate some of the metadata in the HTML tags. The ALT tags of all images should be translated. At times it is also appropriate to change links to resource information. For example, bloggers often link to Wikipedia articles to provide more background information. It usually makes sense to change the link to a Wikipedia entry in the same language as the translation. When you publish the translation an automatic link will be made between the original article and the translation. Optionally, WPML can automatically detect the language of the browser of your readers and direct them to content in their language. For sites that want to automate the translaton process, you can use RSS to enable this. The basic concept is to mirror your content onto a translation hub or translation management system, where translators go to view, create and edit translations. From there the translations can be impoted back into your publishing system via translated RSS feeds. This technique enables you to integrate translations into your website without making major changes to your CMS. One thing you can do is to use machine translation to obtain fast but inaccurate translations for everything you publish. The Worldwide Lexicon RSS translator is an easy way to do this. Simply deploy an instance of WWL, and add your site's RSS feed to the index of sites the RSS translator monitors. It will automatically pick up and translate whatever you publish to approximately 40 languages. You then direct your visitors to go to www.yourtranslationhub.com, where they will see your articles, blog posts etc in translation. They can also edit the machine translations simply by clicking on a paragraph of translated text. By mirroring your content in to a translation hub, users can easily submit, edit and curate translations for your content. You can either host the translations on the translation hub, or you can import translations back into your site via translated RSS feeds. For example, you can set up translate versions of your site at www.yoursite.com/es and www.yoursite.com/fr for Spanish and French, with each importing content from www.yourtranslationhub.com/rss/es and www.yourtranslationhub.com/fr respectively. This approach requires more work, but it enables you to display translations natively within the context of your parent website. You can either publish the imported articles automatically (faster), or store translated posts as drafts/unpublished so that they are reviewed by one of your editors prior to publication.